Like always, I entered the doctor’s office to take the results of my tests. “Oh! Sung Gyu! Enter!”he smiled as always. “How have you been, doc?”I shook his hand and took a sit on the usual, blue chair from across his desk. “Good! Good! And you? How’s Sung Mi?”he looked through his files as he flashed on of his casual smiles. “I heard the great news! Congratulations to both of you, Sung Gyu! You’ll be a great father,”he eyed me in a strange way. I nodded happily. The idea itself, of having a little Sung Mi running around the house was giving me butterflies in my stomach. I am Kim Sung Gyu, 27 years old, an active soldier, married and soon to be father. I looked at the cars passing by and raised the collar of my coat to protect myself from the cold, autumnal wind that was blowing outside the hospital’s walls. I was diagnosed with AML, or Acute Myeloid Leukemia, 2 months ago, right after I was named to go in Irak. I waited for the green light to cross the street to the place where my car was parked. I actually managed to smile despite the bitter taste I had on my tongue. They said that this winter was going to be my last. I got inside the vehicle and closed the door behind me. Taking deep breaths, I managed to make the dizziness go away. It was always like that after the chemotherapy session. But no more. It was the last one. They said that I needed to bit farewell to my friends, to my family, to my pregnant wife. 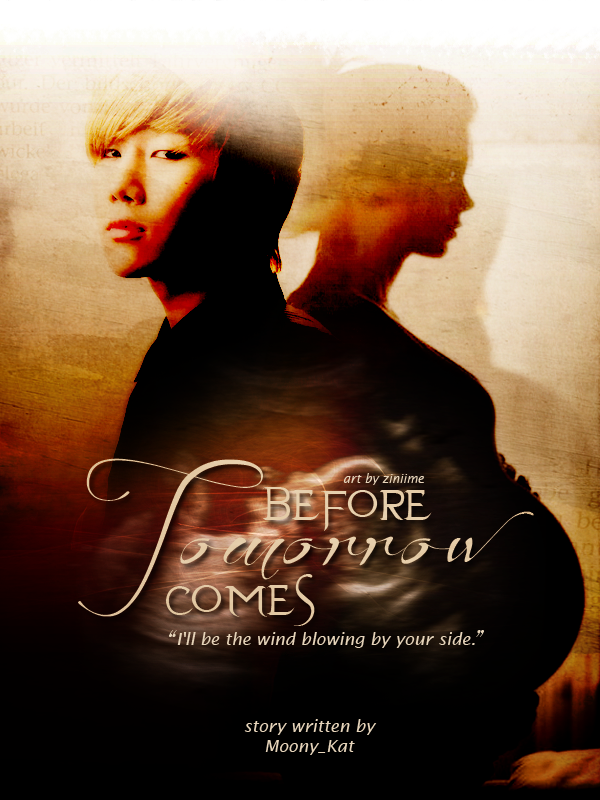 "I'll be the wind blowing by your side." “Excited?”the woman smiled as she entered the ward with the file. Sung Mi squeezed my hand as the doctor let the gel fall on her exposed belly. Then she pressed against the bare skin the ultrasound transducer while watching the images that were forming on the ultrasound machine’s screen. “See that?”my beautiful wife smiled as her eyes sparkled at the sight of our baby. Sung Mi turned her big brown eyes to me. “Yes, we would like that very much,”I muttered, feeling my heart beating strongly in my chest. I looked out the window of our bedroom. The sickly view was like a grey drawing of the crowded city. The buildings were raising tall, all grey and indifferent to the surrounding. The street was crowded by the cars that weren’t moving but were honking instead… That was not the place where I wanted my child to live! Where were the singing birds, the smiling neighbors, the garden full of flowers? How could you ever write a fairytale in this kind of place?! Maybe you’re wondering why your father is writing such nonsense when you’re not even here. To be honest with you Byul, I’m sick. Very ill…From the moment they discovered my illness, they gave me 5 more months to live. That means that I don’t know if I’ll get to meet you, my child… February will bring you into this world, but I don’t know if I will be able to pull my life till then. Don’t be sad, alright? Don’t you cry for me, alright? Your mother will need you more than ever after you’ll be born. I rested my chin against Sung Mi’s knee and watched her as she turned the page of the book she was reading. Immediately, my hands began massaging her soles, from the toes way down to the heels. “I know, I know that! But I don’t want our baby girl to live in a place like this. I want her to have a courtyard where to play in sand, flowers to pick up for you… I want her to live in our dream house,”I smiled to her, but actually smiling to the future. But I had no time to wait. I wonder if Sung Mi ever forgave me. I never got the courage to tell her the truth about my illness…how could I do that? How could I watch her tears streaming down her face because of me? And plus, she needed to be strong for you. Believe me Byul, that there’s no place I’d rather be right now but beside the two of you! But sometimes, God has other plans for us and we have to accept and say ‘Thank you!’. Don’t hate God, Byul! I’m lucky enough he gave me enough time to write all of this for you, to let you know all my thoughts even though you’ll never get to know me in person. I want you to be proud when you’ll show my picture to your future husband and children. ‘This young man is my father. He took care of me, but left before I could say ‘father’ to him… I’m proud of him!’. “How did you get the money for this?”she muttered as we stopped in front of our house. I just smiled and opened the little gate for her. “Happy birthday, Sung Mi!”I wrapped my arms around her shoulders as we watched the white house in front of us. “And ‘Marry Christmas!’”I whispered as the little lights began illuminating the evening air around the large windows. You know how I felt when your mother said I was going to be a father? Like a million of fireworks exploded in front of my eyes! You and your mother made me the richest man on Earth! From that fateful day when I met your mother, the campus’s goddess, till the day I heard about your existence are the days I treasure the most! And then, in our 16th week of existence, I saw your image on the ultrasound machine’s screen…I felt the knees ceding under me. I smiled at the sight of my sleeping wife and gently kissed her cheek before getting up from the king sized bed. The stairs creaked silently under my bare feet as I went down towards the silent office. There, I sat on the chair behind the wooden desk and let my hands caress the cold surface. The pain was too great to handle on my own so my shaky hand looked for the bottle of pills inside the drawer. I swallowed the two painkillers and then I waited for the pain to disappear. My eyes wondered around the room and I smiled, pleased with the view of our family picture. The first time I felt you moving under my palm, I placed my lips on your mother’s belly and called your name: ‘Byul! I’m your daddy who can’t wait to meet you!’. Did you hear my calling? Did you feel my caress? Did you feel my heart beating alongside yours? “Happy new year, son!”father gave me a bear hug, threatening to break my fragile bones. “Sung Gyu…are you ok?”Sung Mi pushed the bathroom door’s open. “I’m fine!”I pushed the door back and closed it in front of her. “Please go to our guests,”I mumbled as I flushed the toilet’s water. I leaned my back against the closed door, letting my tears slid down my cheeks. Was this the way everything was going to end? Was I such a weak man? Byul, please help your mother around the house, alright? Don’t let her be alone at night, alright? Eat everything in your plate and don’t ignore those green things that she’ll be putting in front of you. They actually taste good! Byul, be your mother’s best friend, alright? She knows so many things about being a popular teen, that she’ll come in handy when you’ll need her the most! How about boyfriends? I hope you’ll introduce them to her. She’s pretty fast at reading people and she’ll know if the kid’s just a punk or he’s a keeper. I can’t stop wondering how your teen life will be like. Will you be like me? A total geek, falling in love with the most popular guy around? Then…God help! Or will you be just like Sung Mi and fall for the the geek from the Science class? If that’s the case, be careful not to get lied to ‘coz we can play pretend pretty well! And I broke into tears. Was there really no way for me to meet my daughter? To hold her dearly? To whisper in her little ear just how much I love her? A short scream made me stop and listen to the silence of the house. I ran down the stairs to the kitchen. Sung Mi was looking intensely at the pool of water from under her feet. “Are you alright?”I caught her elbow. What happened next? How did I moved so fast around the house, placing the needed clothes inside a suitcase? Where exactly did I get all that strength from, to carry Sung Mi in my arms to my car and place her on the chair? How did I manage to get to the hospital without causing an accident? “Congratulations! You have a beautiful daughter!”the doctor placed in my arms the baby wrapped in a pink cover. How did it get so dark and cold in there? It got cold in there. It got dark in there. And Byul, please remember this… I love you. I always loved you. And I will always love you. And I’ll always be there, right next to you. I’ll be the wind blowing by your side.